Event Description: A stimulating place to participate in a corporate teambuilding event, the Discovery Place Charlotte — one of the top science and technology museums in the country — is all about hands-on exploration. 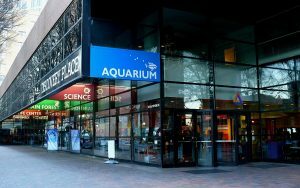 More than half a million people each year visit Charlotte’s Discovery Place, enjoying its huge Imax theater, its static electricity demonstration (guaranteed to make your hair stick straight out), its tropical rainforest, its aquariumŠa microcosm of the entire world, within four walls. During your corporate teambuilding treasure hunt…expect to encounter a giant clam and a submarine; blue and gold macaws; a giant eyeball; and so much more. Gather outside the main museum entrance.